"A simple and juicy solution for dinner." Combine Hellmann's(R) Real Mayonnaise with cheese in medium bowl. Arrange chicken on baking sheet. Evenly top with mayonnaise mixture, then sprinkle with bread crumbs. See how to make an easy weeknight chicken dish that's a 5-star favorite. Also terrific with Hellmann's® Light Mayonnaise or Hellmann's® Canola Cholesterol Free Mayonnaise. Timesaving Tip: Try making this dish with thin-cut boneless skinless chicken breasts! Prepare as above, decreasing bake time to 10 minutes or until chicken is thoroughly cooked through. 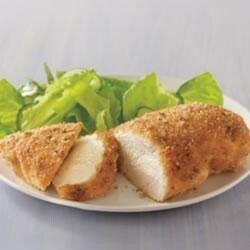 TIP: Omit Parmesan cheese and have Magically Moist Chicken on table in less then 30 minutes. Once you try this you will never just bread chicken again. Truly moist on the inside and light crunch to the coating.I rubbed mixture all over then fully coated in bread crumbs. Moist yes, but greasy! Way to much mayo, and mine did not get crispy on the outside like in the picture. Way too many calories and fat just to get moist chicken. We loved this chicken. It was truly nice and moist and crispy on the outside. I halved the recipe because I only used to chicken breasts. A keeper for me!